Arms: Argent, in base barry wavy of six azure and argent a boat proper, on a chief azure two oars in saltire or between two cushions argent fretted gules trimmed argent tasselled or. Crest: On a wreath argent and gules a dexter arm embowed vested argent holding in the hand proper an oar erect or. Supporters: On either side a dolphin haurient argent finned, eyed and tusked or. Motto: At commandment of our superiors. 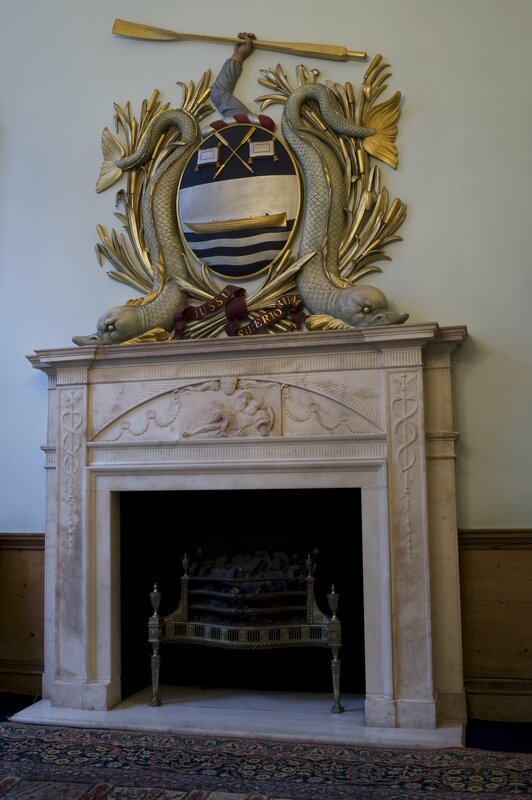 The design of the arms reflects the activities and trade of the Watermenʼs Company at that date (before its amalgamation with the Lightermen in 1700). The boat is a Watermenʼs skiff and the cushions emphasise the passenger carrying function of this vessel. One of the dolphin supporters has been used recently in the grant of an heraldic badge by letters patent of Sir Colin Cole, Garter King of Arms, on 5th April 1983. This is blazoned: “In the front of an oar erect ensigned by a crown of gold, a dolphin naiant argent tusked finned and the tail also gold.